An urban adventure for 8th-level characters. Never before has the great city of Absalom seen an artist rise in fame so quickly, but when his patrons turn up torn to pieces, more than a few begin to wonder if his renditions are a bit too lifelike. 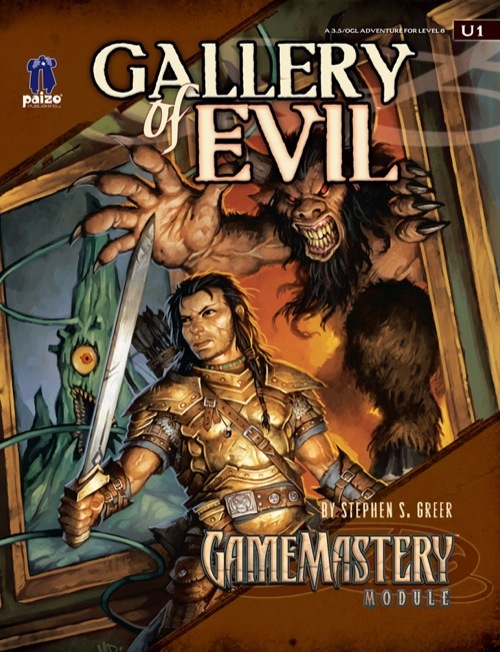 Gallery of Evil is an urban adventure written by Stephen S. Greer that pits players against a mad artist and his vile works. When the mad painter’s visions come to life, the heroes find themselves entering his crazed landscapes to find a way to stop them from tearing the city apart. The adventure includes information on the artist and his vile works, as well as details about the city of Absalom and a map of one of its districts. A very good, clearly written urban adventure. The whole "murder paintings" concept is handled elegantly with monsters and items that support the theme. Good art and cartography. My only problem is that the second part of the adventure is a dungeon crawl, which might be a letdown for those who look for a "pure" urban adventure. Still, Gallery of Evil did a great job of being a sidetrek in my RotRL campaign. Recommended ! I purchased this adventure initially just to read through it. However, upon doing so, I immediately incorporated it into my Rise of the Runelords game. The entire first half of the adventure is a fantastic race around the city. The encounters are varied enough so that it doesn't feel like the same thing over and over. Chases, combat against giant apes, a party and hellish landscapes keep the players guessing the entire time. The second half of the module transforms into a dungeon crawl but set in a modern home with fantastic creatures and traps. The core of the module worked great even when I scaled the encounters to fit my groups level. This module now has me watching for other work by Stephen Greer. Just got done preping this one to run. I picked it up a our FLGS and I have to say: Wow!Sharp, creative and alot of fun. outstanding. For some reason this module screams of "Artist's Loving Touch" from Dungeon #68. My players loved this adventure and I'll bet I could bring up some nostalgia for sure using this mod... especially if it's strewn with overbearing jermlaine!!! 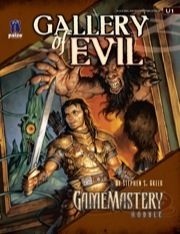 As Gallery of Evil is one of the "Urban" series and our group at the time was a galavanting troupe of rakes (a swashbuckler, elven minstrel, a bounty hunting ranger, a jester, a Gallant, and a Brawler) who lazed about a small sylvan town. They called themselves the Salt Barrel Six because the first time one of them died they packed the body in a barrel of salt to preserve it until they returned home to bury the poul soul (the Jesters first PC of the campaign... he would go through 4 all told)!!! Can't wait to look through this one. When is the pdf version going to be available to buy? I believe it's available NOW. GameMastery Modules subscribers have had access to the PDF since their subscription copies went out. Non-subscribers will be able to purchase the PDF on the product's retail release date—this coming Wednesday, I believe. Ah, thanks for the info Vic. Knowing your previous works and what I've heard about it I'm sure it'll be well worth the wait! Thanks for the vote of confidence, Koriastor. I truly hope it lives up to your expectations. It was a fun adventure to write! Just bought and downloaded the pdf and gave it a quick read: it does indeed seems awesome. The interior art is really good too. Has anyone had a chance to run Gallery yet? I'd love to read a review. I totally love this adventure. It's so easy to get the pcs involved, with those hooks in the module only scratching the surface. In an ongoing campaign it's easy to get them to the first encounter. I can't see any problems putting this adventure into any city of any campaign world. This should be no problem. Ptolus, Sharn, Waterdeep, Greyhawk, or whatever you have! Changing the monsters with those you like more? Just change the description of one of those pictures, and there you have it! The ballroom scene - totally awesome. I can't wait to tell my players "you have 10 rounds, go get him!" The whole story teems (right word?) with potentially further adventures or sidetreks, and the id portrait will be awesome to have in my campaign world (Ptolus) - so many possibilities! The flow of the adventure is also superbly done, as it doesn't matter how a given encounter plays out, there's always an easy way to get the pcs on track again without getting them the feeling of being railroaded. As my players are just hitting 6ht level and start The BANEWARRENS, I will surely use GoE in the near future to give them a break from the Warrens and give them also a chance to attain another level. Nicely done, and I can't wait to see more! Whenever I am going to change things, I'll let you knwo, because I can imagine as a writer you always like to know how things could be different. For me as a non-native speaker, this is the very first module, which I don't have to read a secong time, because it seems to be run very easy! Thanks, Dryder! I'd love to hear how the adventure goes for you in Ptolus and the modifications you end up making. My observation so far: the most popular aspect of this adventure I've seen so far from reader feedback is it's portability. Thank goodness for portability. I just went down to my LGS and picked up U1 yesterday. It was a tough choice between it and D2 (eventually I will be able to collect them all). All GameMastery mods are beautiful in layout and artwork. Along with well concieved stories. Keep up the great work! Sorry for the necropost … But how easy is this adventure to scale? I am looking for something that can be plugged into Westcrown to boost the heroes of the Council of Thieves AP between the end of Bastards of Erebus and The Sixfold Trial. I feel that second half of the Sixfold Trail is a little tough for 4th level heroes.